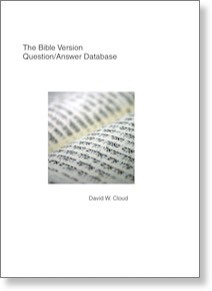 This book gives diligently-researched, in-depth answers to 82 of the most important questions on this topic. A vast number of myths are exposed, such as the myth that Erasmus promised to add 1 John 5:7 to his Greek New Testament if even one manuscript could be produced, the myth that the differences between the Greek texts and versions are slight and insignificant, and the myth that there are no doctrines affected by the changes in the modern versions. The author has carried on extensive correspondence with men on all sides of this issue for the past 25 years, and this book answers the challenges that are made by the opponents of “King James Onlyism,” including James White, D.A. Carson, Doug Kutilek, the editors of From the Mind of God to the Mind of Man and One Bible Only, etc. It also includes reviews of several of the popular modern versions, including the Living Bible, New Living Bible, Today’s English Version, New International Version, New American Standard Version, The Message, and the Holman Christian Standard Bible. PDF eBook is 423 pages, 7 x 8.5 in page size.